If you will be visiting Lake Como or the surrounding area and are considering a private wine tour, then this excursion may be just right for you. We have designed these private, luxury tours for the leisurely gourmet traveler who is looking for a varied mix of food, wine, and culture. On this tour, you will visit an ancient castle, taste wonderful wines, dine in an authentic Trattoria off the beaten path, and finish the day by visiting a delightful medieval town, shopping or sipping on a glass of wine in a charming piazza. From your hotel in Lake Como, your private chauffeur and friendly guide will whisk you away on a wine tasting journey! Your first stop will be at a beautiful castle that is also a winery. The Tenuta Castello di Grumello is located in the Valcalepio hills between medieval Bergamo and the pretty Lake Iseo. The estate has 90 acres of which 50 acres are devoted to the vineyards. You will receive a private tour of the wine estate. Discover the history of the castle and the region to the castle history. Visit the palace, the chapel, and the tower. Then, enjoy a professional tour of the fermentation rooms and barrel cellars. A full tasting of 4 wines (including the excellent dessert wine Moscato di Scanzo) will be next on the agenda. Then you will enjoy a delightful rustic lunch in a close Trattoria within walking distance. After the lunch, you will take in a second cellar visit in Valcalepio. 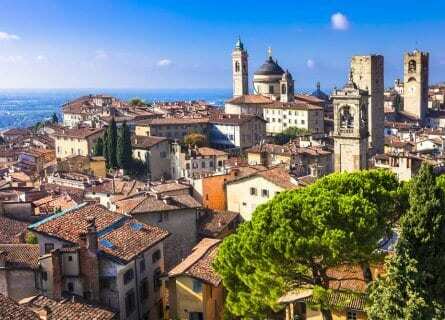 You can climb the Campanone tower and take in the breath-taking view of the whole city, have a rest in the Rocca Park or even take the cable railway up the hills to San Vigilio. Relax at a cozy wine bar enoteca, go gourmet shopping, or just enjoy the winding streets and sightseeing. In the early evening, you’ll transfer back to Lake Como.